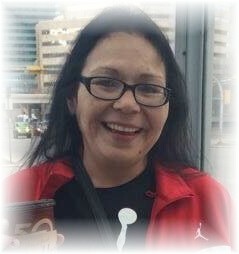 It is with heartfelt sadness that the family announces the passing of Michele Ann Nepinak. The Matriarch of the family. Devoted loving Mother, Grandmother, Daughter, Sister, Great-Grand Mother, Godmother and Aunt. Surrounded by her loving family Michele crossed into the spirit world joining her husband David. David finished building their beautiful white logged house and has called her home. Left to cherish her love, laughter and memory are her children Donny, Amanda, Courtney (Richard), David Jr., Shayna (Thomas), Trisha, and Jordan. Her parents Eleneor and John Musgrave. Siblings, Sandy (Dale - in memory), Joanne, Gina (Leon) and John Jr (Maria). In Laws: Mother-In Law Solange, Alvin (Judy), Brian (Cynthia) Karen (Norman) James (Deanna) Lisa, Robert, and Jeffery (Nadine). Loving Grandmother to Justice (Trent), Tyrell, Brianna, Chelsea, Kailyn, Darius, Ayla-Rose, Simone, Kasey, Kolton, Ella, Emilia, Elisha, and Leia, and Furry Grandbabies Deniro, Pachino, Mawchuck, Coco, and Zeus. Numerous Aunts, Uncle, Nieces, Nephews and Cousins. She was predeceased by her loving husband David, Grandparents Joan and Albert Wapash, Aunt Doreen and Uncle Bill Proctor, Uncle Joey Wapash, Aunt Emily Cochrane, In-laws Joseph, Frances, Alvin Jr., Wesley, Jenna, Freddy Duchrame, and Ayron Wilder. Mikey was born on August 28th, 1962 in Winnipeg, MB. Grassroots to Keeseekoose First Nations, Saskatchewan. As a young woman Michele loved to listen to music, writing poetry, spent long hours drawing beautiful art work. She loved to bead and gift her art pieces to family. In 1978 Mikey met the love of her life David and they were married on May 24th, 1980. Together they were blessed with six children. Mom filled her days spending time with her grandchildren. She loved baking with her grandchildren and often having sleepovers with their Ma. She loved family gatherings and holidays. Mom looked forward to Christmas especially having all the children and grandchildren together. Mom we are going to miss our talks and telling us "Love Your Face". We know you are with Dad now and it gives us comfort knowing that you are together. Enjoy your beautiful white logged house together. We love you and will miss you forever and always. Our family would like to thank Kathy, Rikki, Jen and her special friend Tammy (BooBoo) for all the love and support during Mom's time in the hospital and to all the friends and family who came to visit her in her final days. A celebration of Michele's life will be held at 2:00 p.m. on Monday, April 15th at Korban Funeral Chapel, followed by a potluck feast. Interment will take place at a later date. Active pallbearers; Tyrell Wolfe-Nepinak, Jordan Pascal, Rikki Stranger, Bubba Musgrave, Thomas McKay, Richard Daniels, Nathan Nepinak and Thomas Lavallee.